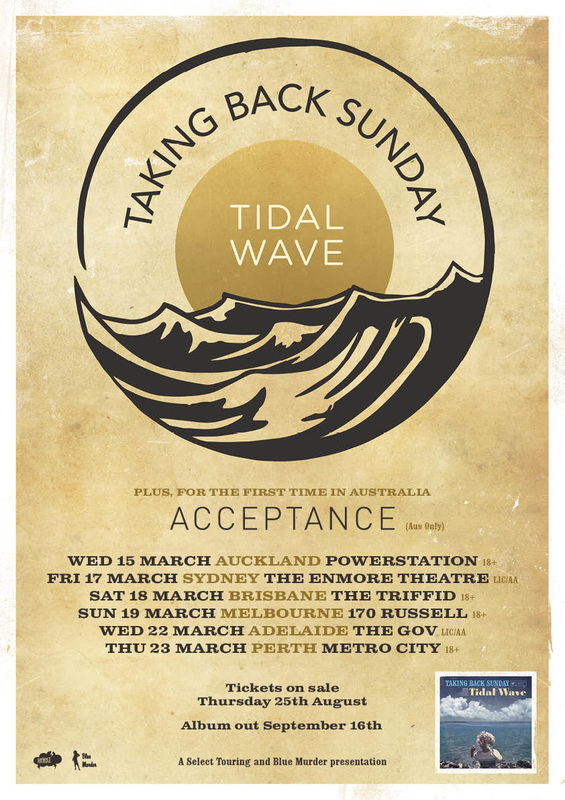 Fan favourites Taking Back Sunday are thrilled to announce they are returning to Australian and New Zealand shores in March 2017, bringing with them a catalogue of chart topping hits from their vast discography plus material from their highly anticipated seventh studio album, Tidal Wave. Few bands from the early 2000’s emo/pop-punk scene have a legacy as mythical as Acceptance. Despite disbanding after the release their debut album, Phantoms, it went on to become a cult classic and amass a loyal fan base that remained devoted through a decade of the band’s silence. Having since reunited in 2015 and with a new album on the way, don’t miss Acceptance for the very first time on Australian soil. With a manic and thrilling live show, don’t miss Taking Back Sunday this March with very special guests Acceptance, in one of the most anticipated rock shows of 2017! Taking Back Sunday’s new album, Tidal Wave, is available Friday 16th September. General public ickets on sale 9am Thursday 25th August.